Approximately 90 second gens from the Japanese church and CARP participated in the assembly which was held in Tokyo, Japan, and were joined by Sun Jin Nim, Yeon Jin Nim, Yeon Ah Choi Nim, In Sup Park Nim. 11 out of 12 Blessed couples (the representative senior couples in Japan who had firmed the foundation of HSA-UWC Japan) attended the assembly as well. True Mother spoke longer that day than at any other occasions. In her speech, True Mother repeated what she had said in Hokkaido: "A shortcut to becoming rich is to do witnessing." She emphasized the value and significance of the witnessing by saying, "Being rich on earth is temporal, but the path to become eternally rich in the eternal spirit world is to do witnessing." She also said, "Today, by listening to the testimonies of the Japanese 2nd gens who hold public missions, I felt the future of the Unification movement is bright and we have hope." Then she explained the meaning and importance of "creation of environment" which was the first thing she had taught us after True Father's Seonghwa. She also talked about the background and the purpose of holding "Top Gun Workshop" held in Korea for 2nd gen leaders, in comparison with the workshop given for the missionaries who had been sent to the world in 1970s. She said the main point of the workshop was "Before you can hope to control the cosmos, you should control yourself." She earnestly asked the participants to establish a new tradition of attending to and going together with 1st gens while inheriting the heart and tradition established by the 1st gen.
She also said that her purpose of visiting Japan this time was to establish Japan as a nation which would accomplish its responsibility for the sake of the world and be loved and respected by the world. She encouraged them by saying the future of Japan would be very bright when Japan could establish indemnity conditions in a right way so that it can be united with Heavenly Parents and True Parents. 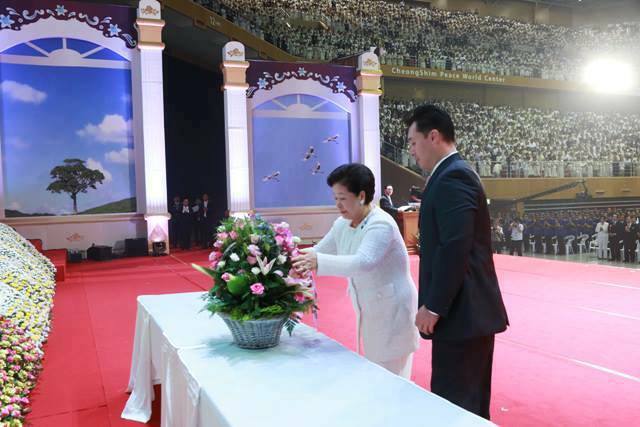 She also said it is the 2nd gens, 3rd gens and the Blessed families of the Unification Church that hold such an important role. She concluded her message with: "Japanese people and their leaders must realize it is a great honor and pride for them to have the Japanese Blessed families, 2nd and 3rd gens." She emphasized that the members must make all efforts so that Japan can become a nation for the world and enjoying love and respect from the world, not only through the external success of Tokyo Olympic Games in 2020 but also with the internal victory of Vision 2020.